Fort Mill, SC – January 15, 2015. For 100 years, General Tire has been providing miles of adventure with its line of high-performance passenger, light truck and off road tires. Now, to celebrate 100 years, General Tire wants to give you the adventure of a lifetime with the ultimate dream garage. Purchase four (4) qualifying General tires between January 15, 2015 and February 15, 2015, and receive 100 entries into the “2015 Garage Dream Giveaway”. a 500 piece Carlyle tool set complete with a professional grade tool box for storage. 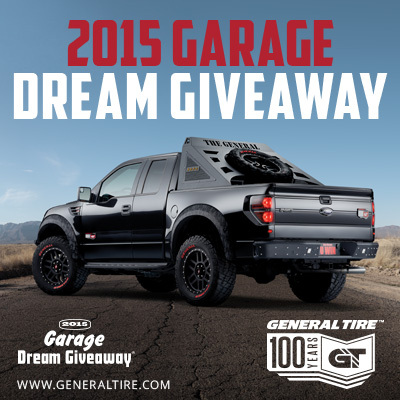 Create a lifetime of adventures with the General Tire “2015 Garage Dream Giveaway. From the GRABBER line of light truck tires, to the G-MAX AS-03 and ALTIMAX RT43 line of passenger tires, General has a tire that will help you get where you need to go. No matter the season or road surface, General has a tire to make anywhere possible. For a dealer near you, or to choose a tire that fits your needs, visit www.generaltire.com. held in September of 2015. For 100 years General Tire has offered a complete quality line of ultra-high performance, passenger, light truck, off-road and commercial tires to meet all your needs. General Tire is a proud supporter of Lucas Oil Off-Road Racing Series, Best in the Desert Racing Series, Major League Fishing, Chili Bowl, Pro-Pulling, Late-Model Dirt Series, Drag Boat Series, World Cup of Softball, American Sprint Car Series, FreestyleMx.com Tour, Zero One Odyssey, and Spec Tire of Trophylite and JeepSpeed. Team GT supports off-road and short course teams including Mikey Childress, CJ Hutchins, Doug Fortin, Harley Letner, Jim Riley, Macrae Glass, Randy Merritt, Ray Griffith, Ryan Beat, Carl Renezeder, Robby Woods and Camburg Racing. global climate protection. Continental is also an expert partner in networked automobile communication. Continental currently employs around 186,000 people in 49 countries.